There are instances when it is not practical or possible for your pet dogs to do their toilet business outdoors. Sometimes, you are in the office all day or the weather is so bad that there is no way to let the dog outside. This is when the best indoor dog potty becomes very useful. Having discussed your options and what to expect from them, here are the top five indoor dog potty to consider. The rule is to start potty training when your puppy is at least six weeks old. At this age, their bladders should be sufficiently matured and well-formed enough to control their urination. With that said, you have to consider whether the indoor potty is for training purposes or for long-term potty. You also need to consider the size of your dog, your lifestyle or how often you will be leaving your dog inside the house, and your dog’s personality or temperament. With that said, here are the different types of indoor potties and what to look for in choosing one. Gone are the days when you use newspapers to housebreak your puppies. These dog pee pads are usually made of paper that has plastic lining underneath. The paper has an absorbing gel that acts pretty much like diapers. Another awesome feature for these pads is that they are treated with scents that attract dogs to potty there. One good training tip is to put the pad near the door until the time comes that they can be placed outside the house. At this point, the puppy is ready and trained to go outside to urinate. There are reusable varieties to these pads as well. Instead of paper, these reusable dog training pads are made of cloth and can be washed in the washing machine or by hand after each use. Another tip is to get trays to protect the floor from spillage especially if the dog is in the early stages of learning how to pee indoors. These pans or boxes are usually made of paper pellets that absorb liquid and hold litter. Once the litter has been soiled, it is disposed of and replaced by a new litter securely placed inside the box. It is then ready for use. This option is suitable for smaller dogs since the boxes tend to be quite small. Larger dogs may find it difficult to sit comfortably in these boxes or pans. This type of potty training is also highly advised for puppies and adult dogs of small breeds. Although buying a new litter is an additional cost for the entire household, it is a worthwhile price to pay considering it helps in effectively training a puppy where to go if he or she needs to go to the toilet. This housebreaking tool is quite a creative way to help your dogs or puppies become familiar with what a proper place to urinate looks like. This tool is made of a containment try as its base and a layer of fake or real grass on the surface. It imitates what outdoor potty area looks like. The downside for this is that training boxes with real grass needs to be replaced once a week or twice a month, depending on the frequency of which it was used. On the other hand, boxes made with synthetic grass can be easily washed and reused back into the trainer. 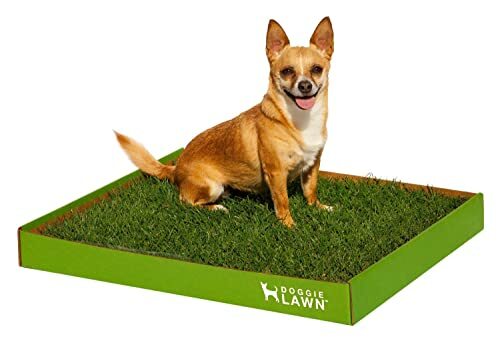 There are dog owners who prefer the real grass boxes as its feel and scent helps their dog’s transition easier and more efficiently than those synthetic ones. 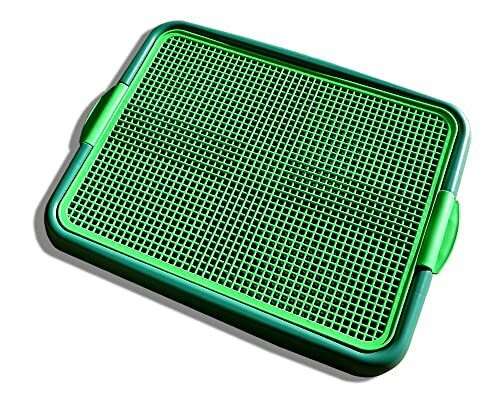 This item from Blyss Pets comes with high quality perforated grate. This allows for easy flow into the training pad. Unlike other indoor potty, this mechanism helps keep your dog’s feet dry and clean. It protects training pads or newspapers from teething puppies. This potty box is 100% disposable so it does not need to be cleaned except for solids removal. It is eco-friendly and user friendly as it is made of real grass as opposed to the plastic potty pads. Also, unlike fake grass, this product absorbs liquid and processes it so that it does not release bad odours. 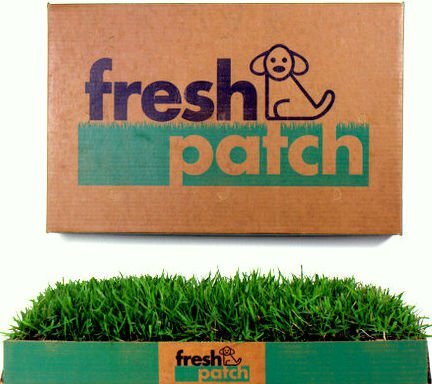 Stylishly made with real grass, Fresh Patch is fully disposable. It comes with hydroponically-grown grass that is dirt-free, long-lasting, and lightweight. The grass has complex root structure that efficiently absorbs urine and its odours. This natural scent attracts dogs without the strong smell that turns off both dogs and humans. Accommodates dogs of up to 25 lbs. 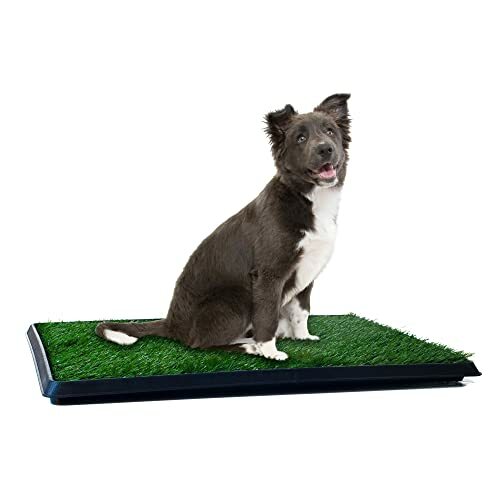 This indoor dog potty is made of synthetic surface that effectively imitates the feel and look of grass. It is ideal for dog owners who live in condominiums or apartments where there is no space for outdoor potty. 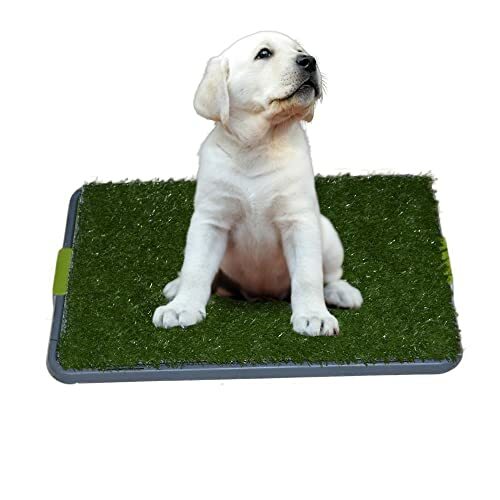 This indoor potty grass system has three layers with non-toxic odour resistant mat made of synthetic grass. The plastic is inserted, which makes easier for fluid to drain. The collection tray is durable enough to hold small to medium sized dogs. Of the five best indoor dog potty products out in the market this year, DoggieLawn Disposable Dog Potty stands out. For one, it is all natural and nothing beats real grass when it comes to training your dog where to pee. Another winner is the fact that it is entirely disposable so you only need to worry about removing pet solids, which is something you have to do with all the indoor potty anyway. The only difference is since it is eco-friendly and user friendly, this product has no mess and no odour. It is also a good alternative to potty pads. All these considered you may want to use this guide to inform your choice in buying an indoor dog potty. Remember to take into consideration your dog’s personality, size, and your lifestyle in choosing the best product for you.